Spell 77, from the Book of Coming Forth by Day. Chapter for making the transformation into a falcon of gold. I have risen in the shrine as a falcon of gold having come forth from its egg. I have flown up and alighted as a falcon of four cubits along its back, whose two wings are like green stone of the south. I have come forth from the night barque, my heart has been brought from the eastern mountain. I have alighted in the day barque. Brought to me are those who are from their primeval time, with them bowing down. I appear in glory. I am united as the beautiful falcon of gold upon the bennu. I sit among the gods of the sky. "To be said on the first day of the first month. Words spoken by Osiris, the scribe, Ani, true of voice. at the words of Nut. give to him praises like Ra. May he be strong upon earth and in the netherworld. mighty of forms of existence." Source: Book of the Dead, Chapter 133, Papyrus of Ani. 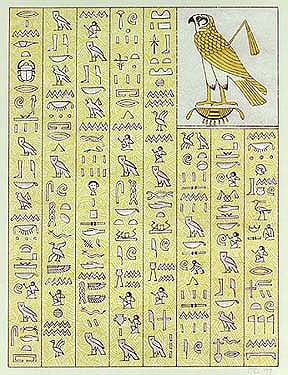 Text reference: E.A.Wallis BUDGE, "The Egyptian Book of the Dead. (Papyrus of Ani)" Dover, 1967. p.138-141. See also R.O.FAULKNER, "The Ancient Egyptian Book of the Dead." Guild Publishing, London, 1985. p.121.